The main reason for replacing any arthritic joint with an artificial joint is to stop the bones from rubbing against each other, which is the cause of knee joint pain. The main aim of this Primary Total Knee Replacement Surgery is to help people return to many of their activities with less everyday pain, knee joint pain with greater freedom of movement. The main indication for Total Knee Replacement in the 1970s and 1980s was pain and the expected benefit from the surgery was a mobile and painless joint. In the 21st century, the main indication apart from pain is ability to have a good functional outcome after Primary Total Knee Replacement Surgery. In this implant the femoral component is made of stainless steel and the tibial tray and the insert are together made of polyethylene. The advantage it has is that more poly is available and hence it lasts longer, also cost-wise it is cheaper than the other implants. The disadvantage it has is that it has no modularity and once the final tibial size and insert size is decided, it cannot be changed. Stainless Steel: This is the most commonly used implant. 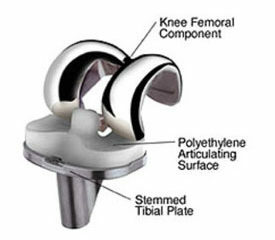 Both the femoral component and the tibial base plate are made up of stainless steel. The insert (polyethylene plastic) is then fixed to the tibial base plate. Trials of various inserts can be done before final insert is mounted on the tibial tray. Hence it is modular. Cobalt Chromium: This is again a fixed bearing implant like the one described above but the tibial base plate is made up of cobalt chromium. 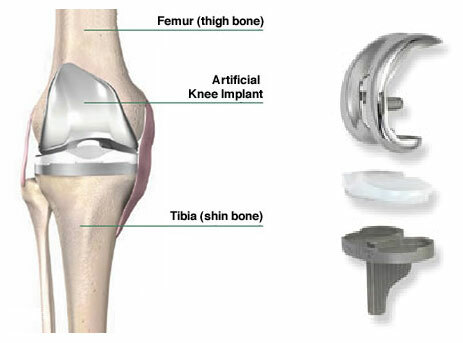 The Rotating Platform Knee is based on a revolutionary design technology, the Mobile-bearing Knee. When patients bend their Knees, the surfaces of their joints roll and glide against each other, allowing their knees to rotate as they bend. Unlike traditional, Fixed-bearing Knee implants, Rotating Platform Knee Implants are designed to mimic this natural movement. This rotation reduces the stress and wear on the implant. 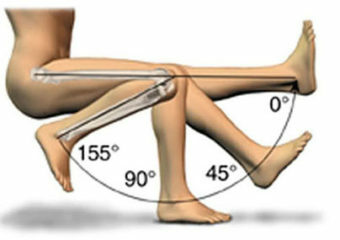 Women may be especially interested in this technology, since their Knees rotate more than those of a man during normal movement. The disadvantage of this Knee is that if there is a gross deformity or imbalance in the ligament, then there are chances of dislocation of the Knee after using rotating platform Knees. This is Rotating Platform Knee with a high flexion component. This high flexion is obtained by taking excess posterior cut on the thigh bone (Femur). The disadvantage of this Knee is that it cannot be done in Highly Deformed Knees, where there is already huge bone loss. With this deep Knee Flexion, common activities like kneeling and squatting become much easier. Positioning and alignment are crucial to the overall performance of the implant. Researchers have found that even a malalignment as negligible as three degrees can lead to uneven wear, instability and increased risk. 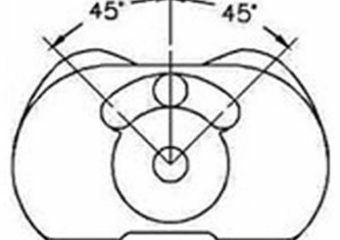 That's why precise positioning and placement play such an important role in the success of implants. In this technology application of a three-dimensional computerized scan of the patient‘s leg is used to create customized surgical guides that are designed to deliver a personalized solution based on the patient‘s unique anatomy.